If you’re like us and are thrilled to see the mercury on the 🌡️ again, then we’re in for a treat with the top things to do this weekend February 1-3 in Lake County! February not only means slightly better weather and one of the greatest days of the year for foodies (Super Bowl Sunday,) but it also brings with it Valentine’s Day, delightful Lake County festivals and so much more. Make the most of the new month with our guide to the top 10 things to do in February! As previously mentioned, why not make 2019 the year that you absolutely nailed Valentine’s Day? We know that only you know what your significant other really wants, but we’re happy to help make some suggestions! Continue here for 34 Valentine’s Day Ideas in Lake County! Take a break from preparing your “Big Game” menu and continue reading for the top things to do this weekend February 1-3! Head to Long Grove this weekend for the highly-anticipated Cocoa Crawl. Shop, dine and make memories at this fun-filled, family-friendly outing. Guests who attend the free-admission event begin at the village’s visitor information center to pick up a map indicating the participating businesses. Long Grove Confectionery, Buffalo Creek Brewing, Village Tavern and many more establishments offer a variety of 19 cocoa-themed treats. Stop by as many spots as you would like before returning to the visitor’s information center to cast your vote on your favorite chocolate-inspired delight. Return to Long Grove on Sunday for Buffalo Creek Brewing Company’s “Super Brews & Beertails:” Anti-Super Bowl Party. The destination brewery will also be serving a plethora of complimentary snacks, for those who find Super Bowl LIII less than exciting. Cocoa Crawl: Saturday, February 2; Noon-4 p.m. Free admission. Downtown Long Grove, 308 Old McHenry Rd., Long Grove. Anti-Super Bowl Party: Sunday, February 3; opens at noon. Free admission. Buffalo Creek Brewing Co., 360 Historical Ln., Long Grove. The Citadel Theatre raises its curtain this for opening weekend of “The Roommate.” The Lake Forest stage shares the comical stories of two middle-aged women, Sharon, a life-long Midwesterner and Robyn from the Bronx, NY. The odd couple needs a place to start their lives over for various reasons. The Jen Silverman farce places the two women together in an Iowa home where secrets about each other unravel. Discover what it takes for the ladies to re-route their lives. “The Roommate” runs on select days through March 3. Friday-Sunday, February 1-3; Friday and Saturday: 8 p.m. Sunday: 3 p.m. Admission: $15-$45. Citadel Theatre, 300 Waukegan Rd., Lake Forest. Meander through many of the small businesses in downtown Highland Park for the Sweet Indoor Sidewalk Sale. The multi-day event concludes on Saturday with the Cupcake Challenge from 11 a.m.-1 p.m. The recipient of the hidden Sweet Star Cupcakes will receive gifts from local shops, valued at $500. Cupcakes will be available at Beanstalk, Beanstalk Big Toys, Eileen Fisher, Ross Boutique, Sprout Kids and Wild Willow. Shop until you drop in the Lake County Northshore city. Friday-Saturday, February 1-2; All day. Free admission. Various locations in downtown Highland Park. Saturday at Gorton – Mr Blotto! Your ticket includes one tie-due cocktail – come jam with us! Break out your biggest bottle of hairspray and join the Gorton Community Center for one of Chicagoland’s favorite jam bands, Mr. Blotto. Attendees at the Lake Forest theatre will reminisce through the decades with covers from some of the greatest eras of music. For over 20 years, the Chicago-area based band has covered notable bands like Phish, the Grateful Dead, the Allman Brothers, Ray Charles, Billy Joel and many other timeless musicians. Saturday, February 2; 7:30-9:30 p.m. Admission: $15-$20. John & Nancy Hughes Theater inside the Gorton Community Center, 400 E. Illinois Rd., Lake Forest. 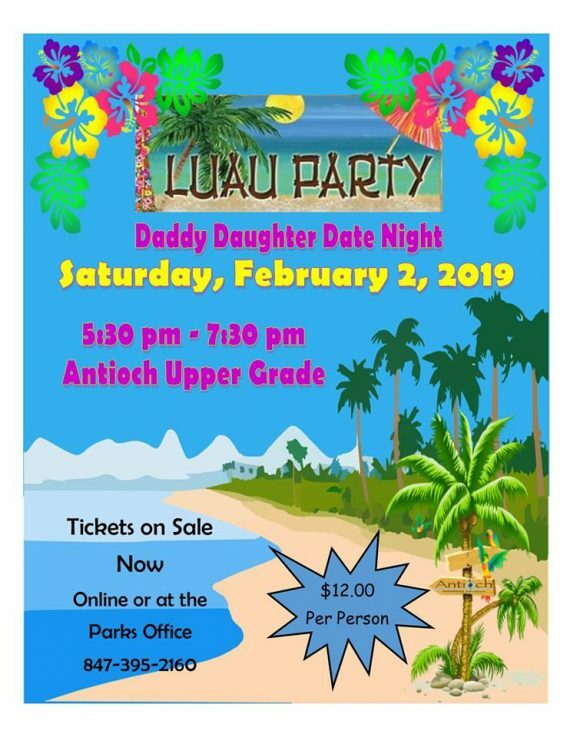 Fathers will treat their tropical youngsters to an evening of dancing, fun and laughter this Saturday at Antioch’s Luau Party Daddy-Daughter Date Night. Grab your leis and hula and cut a rug at the Antioch Upper Grade School for a beach-themed evening of music, dancing, refreshments, sweets and more. Admission also includes a photo-op commemorating the dynamic duo’s night, as well as a gift for the little lady. Aloha! in Antioch. Saturday, February 2; 5:30-7:30 p.m. Admission: $12-$15 per person. Late registration offered until February 1. Antioch Upper Grade School, 800 Highview Dr., Antioch. For all other events and activities happening in Lake County, continue here.